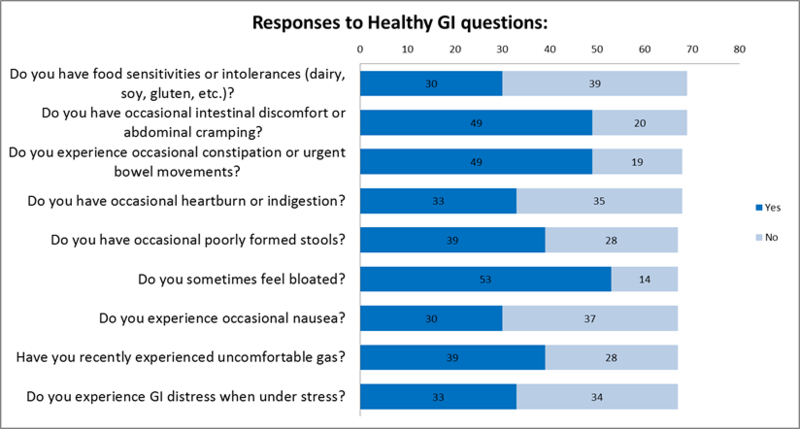 According to above results most of the respondents experience difficulties with their gastrointestinal (GI) health. Increase your fiber intake. Add more fruits and vegetables, in addition to whole grains and bran, to your diet. Add legumes to daily meals. They are among the foods that offer the most fiber per serving and they encourage the growth of bacteria in the colon, adding to stool bulk. Cut back on low-fiber foods such as meats, cheeses, and processed foods. Drink plenty of water (about eight full glasses a day). As you increase your intake of fiber, you may also need to step up your fluid intake. Caffeine-containing drinks such as coffee, tea, and colas have a mildly dehydrating effect on the body, but they do promote contractions in the bowel and can sometimes facilitate bowel movements. Eat on a regular schedule to give your body a chance to regulate elimination. Respond to your body’s signals to pass stool. This will keep your bowel movements regular. Resisting the urge to move your bowels for too long can result in impaction and overflow incontinence, in which liquid stool bypasses the impacted stool and leaks out. Exercise (especially abdominal muscle exercises) and brisk walking are recommended according to the age and physical condition of the individual. More information on digestive disorders!